If I were performing a play titled The Americans, I’d want Jim White to write the score for it as well. It just makes sense to have one of the great songwriting documentarians of the weird, wonderful, holy and sacrilegious aspects of the American South on board to document something with as broad a title as The Americans: Part 1: The Lay of the Land. The play, based on the collected works of Sam Shepherd, was performed at the Juliard Drama School in February of 2010 and White, along with Dan Nettles, composed a set of 16 songs to go along with the play. 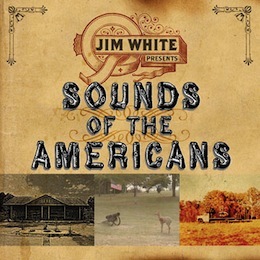 Jim White presents: Sounds of the Americans isn’t the proper follow-up to his 2007 album Transnormal Skiperoo, but it does echo the more whimsical, darkly weird and fantastic storytelling aspects of White’s oeuvre. There are moments of more pure Americana culture as well. “Simulacrum” sounds like a technological chant of devotion to consumerism; “Suckerz Promises” takes the same embrace of the American Dream and mocks it as a mug’s game; and a forward-thinking evangelist in “Esoteric Text Found in a Religious Garbage Can” uses Biblical text to proffer that good and loving Christians take to the heavens to find and minister to their unconverted alien brethren. All of these are mixed in a hodgepodge of blues, r&b, rock, country and musique concrete that take the ‘melting pot’ metaphor to its natural conclusion as the backdrop to the diverse and devoted voices of the narrators. The last track, and the other ‘cover,’ is a re-working of White’s “Bluebird,” originally from 2004’s Drill a Hole in that Substrate.. In a conversation with White years ago, around the time of the release of ..Substrate, he expressed a desire to have others sing his own music – to play on the tracks himself, but have others voice the words he wrote. What starts as a nearly music-less opening driven only by the female singer’s voice slowly becomes an amazing channeling of the original’s haunting examination of desperation into a much more hopeful and daring piece. As a conclusion, it loops back on the opening sentiments of love and brings about White’s own wishes from years ago and finds them actualized. As a documentation of “the Americans,” it couldn’t get much more perfect than that. Jim White is a true artist. I hope all AMERICANS get the chance to experience his music, and his amazing wit, and storytelling. As usual, Europe is way ahead of us,having had a love affair with Mr. White for the last decade. @Linda – The first time I ever saw White live will have been ten years ago this fall at a massive alt-country festival in London, so your comment is pretty dead-on. The opening night of the festival was supposed to have been Lyle Lovett and Earl Scruggs, but with the festival taking place in the aftermath of 9/11, some artists backed out of coming, so the opening night then became Jim White and the Handsome Family. It was one of the few times I’ve gotten to see Jim with a full band. He was in full promotional swing for No Such Place at that point and it was dynamic. I’m going out of my way to see him twice this week here in North Carolina – Thursday in Charlotte at the Evening Muse and Saturday in Winston-Salem at the Southestern Center for Contemporary Art. He’s also playing Friday night in Durham at Duke University. By the way, after seeing Jim in Charlotte last night, do yourself a favor, and if you can catch Jim with his current touring band, do it. They were simply incredible – a great mix of stuff bound for his new LP, a good mix of things from each of his prior LPs and some of the pieces from this Americans collection. And killer storytelling as always.